Republica de Cuba. 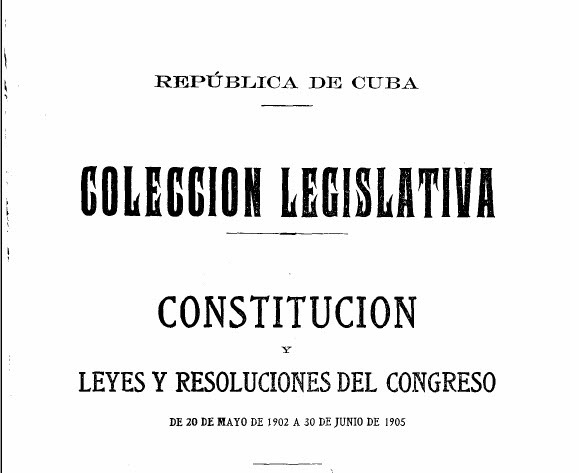 Colección legislativa; Constitucion y leyes y resoluciones del congreso. From LLMC Digital collection. CRL and the Law Library Microform Consortium (LLMC) have renewed the partnership originally established in 2010 to identify, preserve, and provide digital access to important at-risk primary legal and government publications from U.S. and other national jurisdictions. To date, CRL and LLMC have scanned over 12,000 volumes (over nine million pages) of historical legal publications from CRL and sponsored collections. CRL's Global Resources Law Partnership makes these, along with the 51-million page full-text database LLMC-Digital, available to all CRL members. Official gazettes published in selected African and Middle Eastern nations. For more information, visit CRL's Global Resources Law Partnership page, or LLMC Digital.